For a Minnesota country-man, coming to Colorado meant becoming homeless, and inching ominously closer to the city every day. Terri Schweppe does not belong in a city. His handlebar mustache, black cowboy hat and duster expresses clearly that he is a man more comfortable in a small town than downtown. 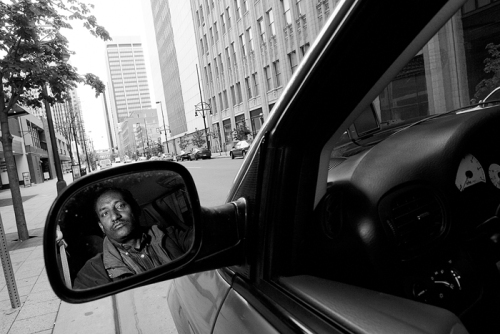 When he moved to Denver, it was a move full of both tragedy and hope. He drove his unreliable van from Minneapolis, across the barren cornfields of the Midwest, to Colorado’s Front Range expecting to find open air and a job. But Schweppe didn’t find the sanctuary he expected. Instead, he quickly became homeless. The two had been roommates and best friends. Schweppe continues to carry Larry’s birth and death certificates. He handles them gently and with great reverence when he shows them. He pulls out his brother’s Minnesota driver’s license.